One of the most commonly overlooked home automation components is the window coverings. Whether they are curtains, blinds or shades, they are lost in the shuffle. Now there are smart blinds and motorized window shades to help cover that. To overlook this vital part of a home is to give away valuable resources. Most home automation targets lighting, temperature control, and efficiency. Wiring your smart blinds and motorized shades into your system saves electricity. Electric savings is always money in the bank. Here are five smart blinds or motorized shades to look at. What’s better than motorized shades that offer one screen to block the sun and another to make the room completely dark? How about being able to run on D batteries and save you any electrical costs? The great thing about these smart blinds is that they can be controlled by remote. They are controlled by off the shelf “D” batteries that can last for years with moderate to heavy use. Best of all, the homeowner has a choice of fabrics and design. One of the greatest selling points to any home automation enthusiast is the ease of use. Even better these blinds boast set and forget. The Appeal Ultra is one such gadget. These smart blinds offer solar recharging capability and a light and temperature sensors that are triggered according to customized instructions. 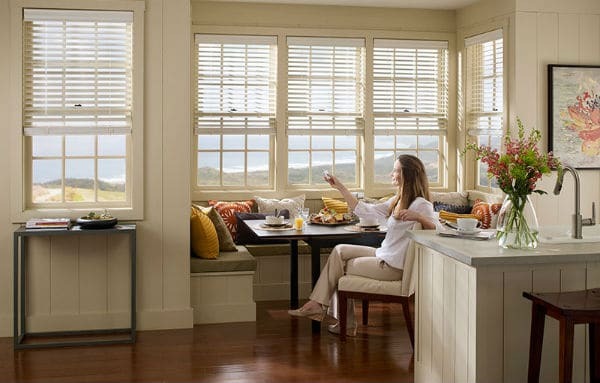 You have the luxury of one-touch control on all the blinds in the house. They are wireless and you have the option of controlling all blinds or just one blind. Moving on with Bali motorized smart blinds. This is a great addition to any home. These motorized systems fit your custom home design helping you make your room sunny or more private with just one push of a button. It has a motorized smart tilt that offers a minimalist, clean, and uncluttered design. Even better your smartphone controls the system. Somfy offers a little of everything..all motorized. Whether it is an awning or some nice blackout shades for your bedroom, Somfy offers you choices for your smart blinds. Without a doubt one of the most versatile companies for automated window coverings in homes and businesses. Their website boasts wired and wireless systems. With a handheld remote and the ability to set timers and sensors, you will always be in control. Lastly, Lutron Serena offers a system that can easily survive 3 to 5 years faithfully. The shades move in perfect silent unison. These smart blinds offer aesthetic and affordable sun-blocking solution that runs on battery-powered rollers. Without a doubt, the downloadable app makes Lutron attractive. Controlling the amount of light and heat entering the house can equate to major savings in the long run. It stands to reason that a short-term investment into smart blinds today pays off in the long term. A final word of advice, do not pick coverings based on just performance.Picking something that aesthetic pleases the senses at the very least should be a consideration.